people read and tore me down. buried my pages deep in ground. 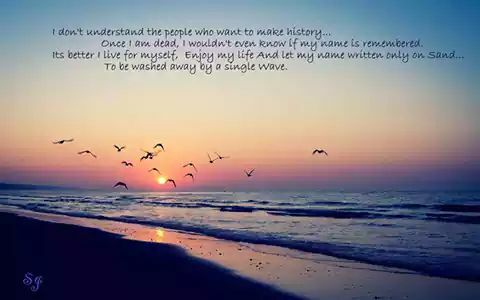 I don’t want to be remembered, i don’t want my name to be written in history. When i am gone, nothing would actually matter. All i want is to live a life so full, full of love, full of zest. So that when i die, i die content, satisfied with everything that i am. Mirror mirror on the wall, why don’t you just break and fall??? The evil queen in snow white’s tale, stands before the mirror and asks, “Mirror mirror on the wall, who is the fairest of them all?” And the mirror would reply “You are my majesty” and she would be very happy. But one day it said “Snow white is the fairest of them all” and then started the whole quest of hunting and killing little snow white. So, THAT mirror never lied. WRONG. No mirror lies, EVER. But, don’t we wish it could? In fact, we do. It would be so much better if that thing on the wall lied. So many problems could be solved. I want to look slim, it reflects me thin. I want to look fairer, it obeys my order. I need my nose to be a little sharper and it says “Yes Ma’am”. How nice, right? I have seen people spending generous amounts of time in front of this object. Sometimes admiring themselves, sometimes frowning. Some are over-obsessed with their faces, some hate to even see it. Some people have a problem with their bodies, they are fat, or skinny, or they just don’t “fit in” the ideal body standards. Some don’t like their nose, ears, eyes, hair, hands, or just everything about them. Even the people who THINK they are all good and beautiful, someday, sometimes, think “I wish I had brown eyes, or longer hair, or you know, little feet”. And nowadays it is spreading like some epidemic. Everyone wants an ideal body, a beautiful face, glowing young skin, nice hair. People are running to the gyms, dieting, going for surgeries, eating god-knows-what’s-in-them pills, buying cosmetics like crazy and what not! I am not saying that being fit and healthy has something wrong with it. One needs to be healthy. The body is your temple, you need to maintain and respect it. One should do whatever possible to keep it in the best of state, but in a way that does least harm to it. But yes, craving for this “ideal physique” is insanity. Six pack abs or 36-24-36 or zero figure, is simply not needed. We were not all meant to look in a similar way. We are not factory-made articles. Nobody in this world is an exact copy of you. Some are chubby, some are slender. Some have black eyes, some blue, some have curly hair, and some have straight. Some women are curvy, some are not. Some men are muscular, some are lean. Some people are tall like the Eiffel Tower; some are short like snow white’s dwarfs. You don’t need to do anything to yourself. You are perfect as you are. There is beauty in this uniqueness. Your body, your eyes, that nose, your skin, it was gifted to you. Nature made you that way. How can anything be wrong with it? It is a gift. Stop being so mean to yourself. Put up a nice smile on your face, and I bet you will look charming. Stop tampering with your bodies for this useless pursuit of looking a particular way. And just think why you do this. Just because the world has a concept of how one should look? Do you ever do it for yourself? NO. We do it because everybody does it. Something is trending, we want it too. Even if it destroys us.We see ourselves through the eyes of others. Drop all these concepts, these defined do’s and don’ts, shed off everything you thought before. And look in the mirror like you are a mirror. Reflect without perception, pure. And you will find you are such a wonderful creation of nature. Undoubtedly, PERFECT. So, once upon a time, (no, not THAT old, just a few years back) when I was in 8th standard, I used to go for a tuition. (I was an exceptionally weak student of mathematics) My Tuition teacher was a strict, cruel, grumpy, old lady. (You remember Cinderella’s step-mother?) She always wanted the homework completed correctly and neatly, the students reaching the class on exact time, and pin-drop silence during the class. So on one not-so-fine day, I reached the class 20 minutes late. As I entered, she eyed me like a snake eyes a little rat. I told her that my bicycle’s tire got punctured, and apologized for the delay. (Actually I had fallen asleep, was woken up by my mom’s fifteen hundredth roar and was forced to come to class) She let me in, and as soon as I took my seat, she asked me to present my homework. I placed an open notebook on the table, containing only the questions which were given to solve for the homework. (But they WERE WRITTEN NEAT AND CLEAN). She frowned. (And uttered a series of blah blah and more blahs). As a punishment, I was supposed to sit there and complete the work, as the rest of the class studies the next chapter. A few minutes later, a friend of mine, quietly sneaked a rubber rat into my lap. I saw, I yelled, I jumped, and I fell. On the floor. With my chair. I was a dead girl now. I could see the lady’s fiery eyes from the floor. And before she could say a word, imagine what I did. I smiled at her. A stupid, little, cute smile. ( I had hit my head hard you know). And to my shock, AND surprise, the lady started laughing (And the entire class as well). She helped me up, brushed the dirt off my clothes, and forgave my punishment. As I sat wondering one day, what I concluded from this incident was that a smile, a genuine, innocent smile can work wonders. When we were little, we could actually smile naturally. Because back then, we did not know how to fake it. As babies, we smiled because we liked something, or somebody. But as we grew up, we learned to smile out of formality, because if we didn’t, people would find it rude. And after years of practiced smiling, we have lost our natural, beautiful smile. I see faces, all so cross, so angry, so annoyed and then at some point when they actually smile, (mostly at Kapil Sharma’s jokes nowadays), I see them turning beautiful, lighted, bright and radiant. This is something you can feel as well. Let go of this plasticity someday, and smile and laugh straight from your heart. A smile that you can feel, that can lighten the burden on your little head, which can make your eyes shine. And you feel so much better, so weightless, and you look so very charming. And with this effortless smile of yours, you will see others smiling with you. Try it, wake up in the morning, smile at yourself in the mirror, and then smile and wish a happy good morning to everyone you meet. And I’m sure they will do the same. Your day is going to be so much better, and maybe you could make someone’s day better too! And remember, sometimes a stranger’s smile is a lot more comforting than a friend’s thousand words. So smile, and make the world smile with you!